POVCOMP 2004: Viewing Page for "Bradbury Atrium"
The Bradbury Building, built in 1893, is one of Southern California's most remarkable architectural achievements. Its plan was commissioned by real estate and mining entrepreneur Louis L. Bradbury who decided to build it just a few blocks from his home on fashionable Bunker Hill in Los Angeles. After rejecting a plan submitted by Sumner P. Hunt, Bradbury approached junior draftsman George Wyman. Wyman is said to have accepted the commission after consulting an ouija board. Wyman was influenced by Edward Bellamy's 1887 book that described a utopian civilization in the year 2000. The typical office building was described as being a "vast hall of light received not alone by the windows, but from a dome overhead." The interior of the court is flooded with natural light. In the true spirit of Los Angles, it has been featured in many movies, from DOA in 1946 to Blade Runner in 1982. 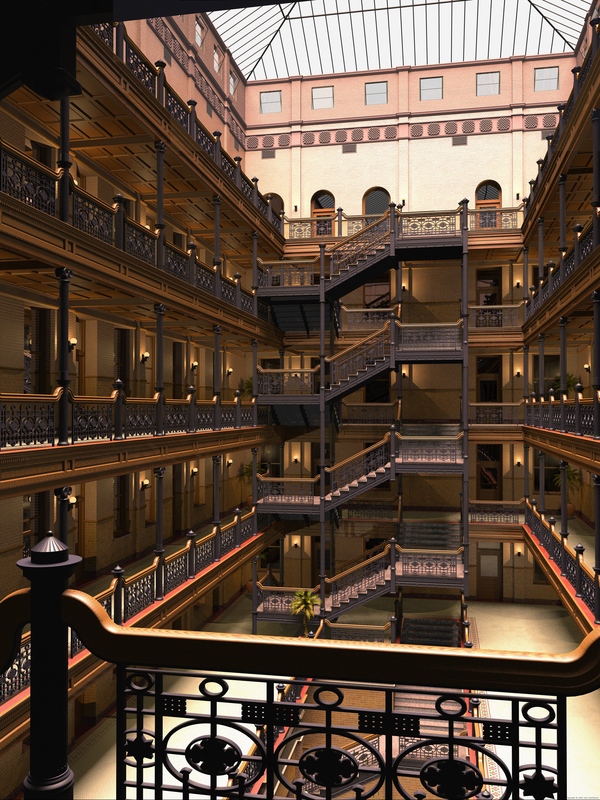 I have been fascinated by the Bradbury building ever since I saw it in the movie Blade Runner and heard that it was a real building in downtown Los Angeles. 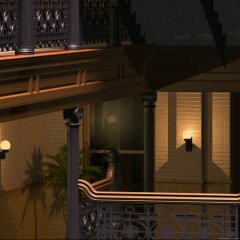 It is breathtaking to visit and I wanted to recreate it's dramatic atrium in Povray. 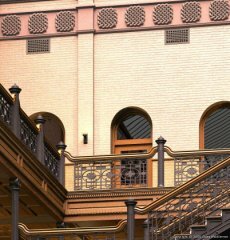 High resolution photographs of the Bradbury building can be found on the Internet. I used these for the basic structure and guessed at the fundamental dimensions. Not being constrained by a client who must pay for the building, I have added one floor to the design of Wyman. I believe the extra floor is visually more pleasing and creates a more dramatic atrium. I did not accurately reproduce the decorative iron work or the freize because of their complexity but I created my own patterns which were simpler to model mathematically. I also left off the iron elevators which run up through the center of the atrium partly because I ran out of time and partly because they would tend to clutter up the three dimensional space. The three dimensional model is quite complete and was built without anticipating camera locations. I have several viewpoints of the atrium other than the main image which I will try to add to the submittal package. (Some of these were created before I added the extra floor.) The main image uses hall lighting. These lights minimize the benefit of radiosity and because of the slow rendering speed with the lights I turned this feature off. For other views I had the lights off and used radiosity to illuminate the hallways. This can be seen in one of the supplemental views. Much time was spent on details that are lost by the scale of the final image. I hope that some of this detail is captured by the accompanying detail images. The brick walls were created using commercial texture maps and bump maps. The hue of the maps were modified in Paint Shop Pro to better match the real colors in the Bradbury interior. The pattern on the freize is a Celtic knot created using the Knots3D program by Steven Abbott and exported to pov format. The window glass is an isosurface modified with 3D noise to create realistic warp in the glass. The palm tree was created using POV-Tree by Gena Obukhov. The image was rendered on a home made computer with dual Athlon 2600 CPUs. Memory is 2GB which is required to avoid swapping. The final render for the main image took approximately 10 days. Perfect example of the sort of architectural modelling and rendering that can be done with POV-Ray. Main complaint: the lighting, which is technically good but not very interesting. Such a building screams for something more dramatic. It's not for nothing that the Bradbury was used in Blade Runner. Great example of the use of POV-ray for architectural modeling. Good detail, just a bit "dry", could have used something to give the atrium some more life.